It might surprise you that the difference between coffee and espresso is the brewing method. Some people might think that it is the darkness of the roast level or even the origin of the beans. And while they are partially correct, the reality is that any coffee bean can be used for either drip coffee or espresso. Because the brewing process is different, there are specific requirements for each of the brews that each requires. We will go through all the differences that can make the coffee bean better suited for one or the other. In the end, it all comes down to personal preference. How the coffee is prepared is the essential difference between coffee and espresso. Coffee is brewed as an immersion, allowing the coffee to mix with the water at about 200 degrees F in the filter before dripping through into the pot, whether it is through an automatic drip machine, a pour over, or even french press. Espresso uses a higher water temperature, almost boiling, and high pressure to force the water through the coffee in a matter of seconds. Because of this difference, there are a few variables that make espresso different than brewed or drip coffee. There are two types of coffee beans in the world, Arabica, and Robusta. Arabica beans have more flavors of origin and less caffeine than Robusta beans. Robusta beans are stronger tasting and often bitter due to the higher caffeine content as caffeine carries a bitter flavor. One thing that Robusta beans are excellent for though is producing fantastic crema. Crema is the caramel colored foam that sits atop freshly brewed espresso. Often roasters will blend Arabica with Robusta to get a nice blend of both with the ability to produce a good crema. Often the Robusta beans overpower the flavors of the Arabica beans which can lead to a muddled taste. The roast level is another difference between the two beverages as most espresso beans are roasted darker than most drip blends. However, as coffee knowledge has grown, now even medium or light roasts are used for espresso with astonishing results. Single origin coffee that would typically be roasted for drip coffee or pour overs can be prepared for espresso. 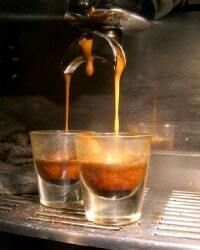 The flavors of origin are much more concentrated in the shot of espresso. Your best chance to get the full flavor profile of the bean is in an espresso shot. Many roasters label their coffees for espresso or drip because it is their opinion that particular roast’s flavors are accentuated and will shine more with that specific brewing method. Just because the bag is labeled espresso doesn’t mean that you have to have an espresso machine at home to brew it though. Any espresso blend can be used for brewed coffee, and any bean that is used in drip coffee can be used for espresso. One of the most significant differences in the brewing process is the actual grind requirements of each method. Drip coffee requires a medium coarse grind so that water can flow freely through the filter and the coffee grounds to not escape the filter and cause sediment to fall into the cup. Drip coffee relies on the amount of time in the infusion to extract the flavors of the coffee. Espresso beans need to be ground extremely fine so that when they are tightly packed into the filter of the espresso machine, the water can still come through the filter. The beans, when packed correctly actually form their own filter for the coffee, allowing a highly concentrated extract to be the end result. Grind consistency is a crucial variable to understand even when dealing with various ways to brew coffee. Pour overs demand a finer grind than the French press, and automatic drip machines require a finer grind than pour overs. This article is an excellent resource for grinding your coffee. The longer the coffee has contact with the water, the more caffeine will make it to the cup. This is why espresso has less caffeine, 40 to 75 mg per shot, and an 8 oz brewed coffee has between 80 and 185 mg per cup. Espresso will, of course, catch up with coffee if you are doubling up shots in your drink. Espresso is also meant to be drunk quickly while brewed coffee is to be enjoyed over a longer period. If the espresso beans have more Robusta in them, the caffeine content will be higher than beans made up of primarily Arabica. Espresso will naturally have a fuller flavored taste with a thicker body because it is a highly concentrated extraction. 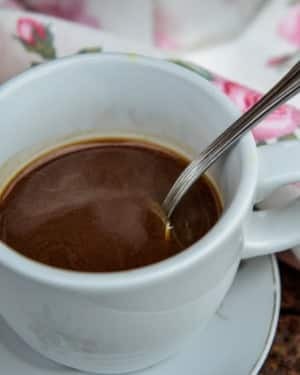 A well-extracted espresso shot should offer a well-balanced taste between sweet and bitter. The flavors of origin from the natural chemical makeup of the beans are more concentrated in a cup of espresso than in brewed coffee. Because the flavors originate from these chemicals, they are naturally highlighted with the addition of steamed milk. The fat in the milk blends with these chemical compounds and accentuates and even softens and sweetens the intense flavors. Brewed coffee is lighter and less concentrated than espresso. The difference can be compared to a fruit tea versus a spoonful of fruit jam. The same flavors are there, just not as concentrated. Espresso and coffee offer something for everyone to enjoy. It all depends on how you like your coffee. Strong, bold flavor in a little package or a hot cup of coffee to enjoy and savor. So now when you are in the store looking to buy coffee, you will know that it is not the name on the bag that makes espresso different than a drip blend, it is the process. Your personal preference and experimentation will determine which kind of coffee is better suited to your own taste and brew methods. Feel free to try different coffees; you may find a new favorite drip coffee with an espresso name on the bag. In the end, the two drinks are essentially a variation of the same beverage; descended from the same bean, enjoyed in entirely different ways.